Passlack, Barkok, Friedl, Dimata and Benes (l-r.) are some of the brightest young lights in the Bundesliga. David Alaba is not the only Austrian left-sider turning heads at Bayern Munich these days. Friedl represented the Under-19s last term but travelled with the club to Doha for their winter training camp earlier this year and trained regularly with the first team, before turning professional in July. As an energetic left-back with a penchant for set pieces, Friedl has clearly been crafted in the Alaba mould. The 19-year-old stood up well in pre-season and provides Carlo Ancelotti with a quality alternative to Alaba’s current understudy, Juan Bernat, on the left-hand side of the Bayern back four. Eintracht Frankfurt head coach Niko Kovac wasn’t exaggerating when he labelled Barkok “a gem in the ranks”. The Croatian strategist had not long called his prodigious midfield talent from the bench away to Werder Bremen on 20 November 2016 when the 18-year-old hit a 90th-minute winner to send the visiting crowd into raptures. Wolfsburg's goals came largely via new skipper Mario Gomez in 2016/17, but they may have found the ideal support for the Germany international in Belgian forward Dimata. The Under-21 international made waves in his breakthrough season for Oostende last term, his 11 goals and three assists in 24 Jupiler League appearances the precursor to a cross-border summer transfer to the Bundesliga. Although Benes joined Borussia Mönchengladbach in June 2016 after a head-turning season in his Slovakian homeland with Zilina, it was only towards the latter stages of last season that Foals fans began to see the 19-year-old midfielder’s raw talent – the creativity and vision - laid bare. Benes made his debut against none other than Bayern, and the first of three Bundesliga starts yielded his maiden top-flight goal. 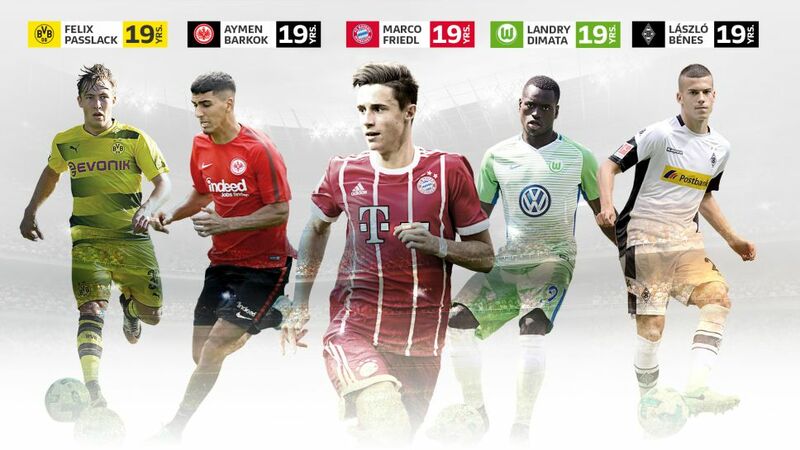 The seeds of promise sown, and with midfield synergist Mahmoud Dahoud moving to Borussia Dortmund, expect to see the man dubbed "the new Marek Hamsik" flourish in 2017/18. Lukasz Piszczek’s heir apparent on the right-hand side of the Borussia Dortmund defence, Passlack is banging hard on the door of the BVB first team. The 19-year-old has already made 13 Bundesliga appearances, including ten last term, and has accumulated invaluable minutes in the UEFA Champions League, DFB Cup and Supercup. Dislodging Piszczek may take time, but Passlack’s versatility – he has played on both sides of defence and midfield since making his full debut in March 2016 – opens up a number of doors for the 2015 Under-17 Fritz Walter Gold Medal winner. He also has the youthful exuberance and aggression tailor-made for a life of Gegenpressing (organised and intense pressing of the opposition).